Rising usage of elevator and escalators at airports, malls, subways, hospitals, office buildings, and other commercial spaces to offer ease in transit is driving the market growth. Growing geriatric population is another factor boosting its installation in the residential sector. Booming construction sector resulting into rapid demand of elevators in high-rise and mid-rise buildings is further pushing the market growth. Socioeconomic factors such as the rise in per capita income and increase in standard of living are also impacting the market growth positively. The latest report by Value Market Research expects the Global Elevator And Escalator Market to reach USD 167.2 billion by 2025. It was valued USD 99.1 billion in 2018. The report foresees a 7.8% CAGR from 2019 to 2025. In 2018, hydraulic elevators emerged as the leading product segment. Advantages of hydraulic lifts are it is efficient, relatively cheaper, occupies less space, easy to install and maintain are driving its demand. By application, residential building led the segment in 2018. Rising construction of high-rise and mid-rise residential apartments is driving the segment growth. High disposable income, an increasing trend of nuclear families is pushing the construction of the residential building. Rising installation of elevators in residential building owing to rise in old aged population and patients suffering from arthritis and other joint related disorders are boosting the market demand. Geographically, Asia Pacific led the market and has accounted for major market share in 2018. Rapid urbanization and industrialization in developing countries such as China and India are driving market growth. Also, High population density, the rise in disposable income and increase in standard of living are some of the prominent factors spurring the regional market growth. Major vendors of the market are Fujitec, Hitachi, Hyundai, Kone Elevator, Mitsubishi, Otis, ThyssenKrupp, and Toshiba. 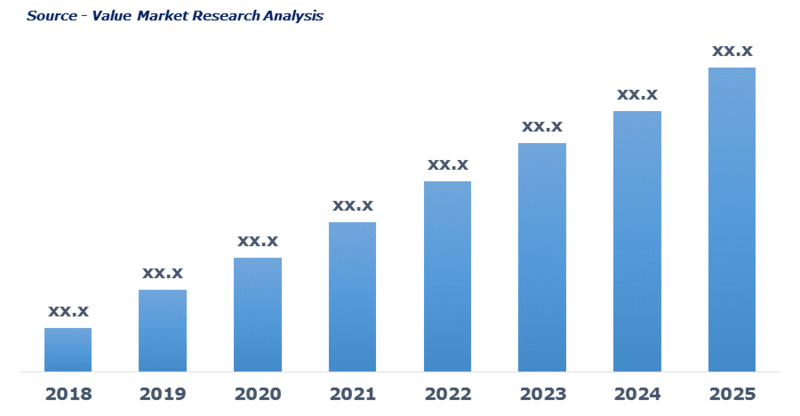 As per this study, the Global Elevator And Escalator Market was valued USD 99.1 BN (by revenue) in 2018 and is anticipated to reach USD 167.2 BN by 2025 with a CAGR of 7.8%. The elevator is a power-driven installation that runs in definite vertical guidelines and lifts up people or goods between floors of the building. Whereas, the escalator is the set of moving stairs that are electrically powered used to carry passenger upwards or downwards in subways, buildings and public utility areas. Both elevators and escalators are used to provide rapid and convenient transportation between floors of the infrastructure. Rising construction of airports, subways, commercial complexes, shopping malls are majorly driving the elevator and escalator market growth. Rising installation of elevators and escalator in high-rise building and skyscrapers is further boosting the market growth. Rapid urbanization, along with the increasing count of retail and metro station is again pushing the market growth uphill. However, high installation cost may hinder the market growth. This detailed market study is centered on the data obtained from multiple sources and is analyzed using numerous tools including porter’s five forces analysis, market attractiveness analysis and value chain analysis. These tools are employed to gain insights of the potential value of the market facilitating the business strategists with the latest growth opportunities. Additionally, these tools also provide a detailed analysis of each application/product segment in the global market of elevator and escalator. The broad elevator and escalator market has been sub-grouped into product and application. The report studies these subsets with respect to the geographical segmentation. The strategists can gain a detailed insight and devise appropriate strategies to target specific market. This detail will lead to a focused approach leading to identification of better opportunities. Furthermore, the report comprises of the geographical segmentation, which mainly focuses on current and forecast demand for elevator and escalator in North America, Europe, Asia Pacific, Latin America, and Middle East & Africa. The report further focuses on demand for individual application segments in all the regions. The report also covers detailed competitive landscape including company profiles of key players operating in the global market. The key players in the elevator and escalator market include Fujitec, Hitachi, Hyundai, Kone Elevator, Mitsubishi, Otis, ThyssenKrupp and Toshiba. An in-depth view of the competitive outlook includes future capacities, key mergers & acquisitions, financial overview, partnerships, collaborations, new product launches, new product developments and other developments with information in terms of H.Q.